Okay, so a week or so ago, I got the idea to start to buy books that I may need for starting that homestead (which I plan to grow into a town). I ended up buying a few more books than I had intended (just to qualify for the free shipping . . . yeah . . . that’s it). The one in the upper middle “The Encyclopaedia of Country Living by Carl Emery” is the one that I really wanted and I have started reading. This one was started back in the early seventies, and has been worked on and tweaked every since. It has all kinds of stuff in there for growing your own food, and yes for going back to be as much of a “Pioneer” as you want (as in doing everything yourself, on your own land). For me, I thought that it was a good place to start for someone looking to homestead and be as self-sufficient as possible. Yet, I don’t want to live like a pioneer or like and Elf in the trees, forsaking all modern tech. I want to move forward and build the future. I want a fully modern place with technology that we develop, in a town focussed on science for the sake of science in the pursuit of: Science, Technology, Knowledge and Understanding. For me, I want to break the cycle of: Work -> Debt -> Work More = Working Poor (AKA: Modern Peasant). The town idea is to help break that cycle for more people than little old me (but I digress). You have to start somewhere, and since the primary goal is to be self-sufficient, you go back to the basics and build from there. 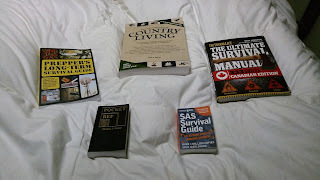 The other books were mostly for interest or stuff I figured was a good idea to have on hand. The one I am most amazed at (other than the encyclopaedia) is the Pocket Reference by Thomas J. Glover (ISBN# 978-1-885071-62-0) If you do a web search for that, the book will come up. This thing has all sorts of charts, lists of info along with formulas covering a wide (and I mean wide) variety of information, and it is quite small and cheap. I recommend everyone pick up a copy and have it on hand. You know, for when you may need it but can’t Google it. As far as my “When You Need It, But Can’t Google It” library, I will keep adding to it as I move forward, with all manner of things that I may need once I am there. As far as reading the encyclopaedia, it is good that I can actually get into reading it. I can actually start to work on that homestead idea without it hurting, because it seems so far away into the future. For now, I will work towards it by keep trudging forward.